An extensive, innovative range of label converting machinery and comprehensive technical after sales support are amongst the prime reasons for our continuing success as a world leader within the label and packaging industry. Through constant development and investment A B Graphic International Ltd have become market leaders in fully modular digital converting, inspection rewinding equipment and turret rewinding. A B Graphic International Ltd also produce machines for many specialist applications including RFID insertion, laser die cutting, booklet label machines and 100% camera inspection systems. A B Graphic International Ltd (formerly Burton Engineering Co Ltd) was established in 1954, and since that date has not only grown into a truly international business, it has remained a family owned company. Over the years A B Graphic (Burton Engineering) has produced a wide range of machinery from tag and ticket machines to computer labels. 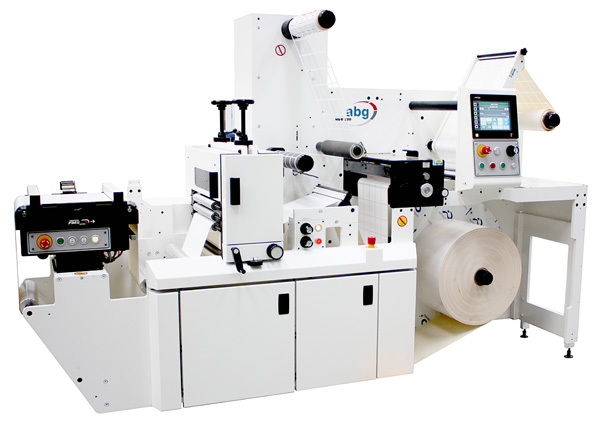 More recently A B Graphic International Ltd only produces equipment for the label and packaging markets. In the past A B Graphic have also acted as agents for numerous press and converting manufacturers. Today A B Graphic International Ltd only deal in their own specialist equipment for labels and packaging. With a continuous enthusiasm and dedication to customer satisfaction and support, A B Graphic International Ltd aim to continue leading the label and packaging converting market through continuous investment and development. 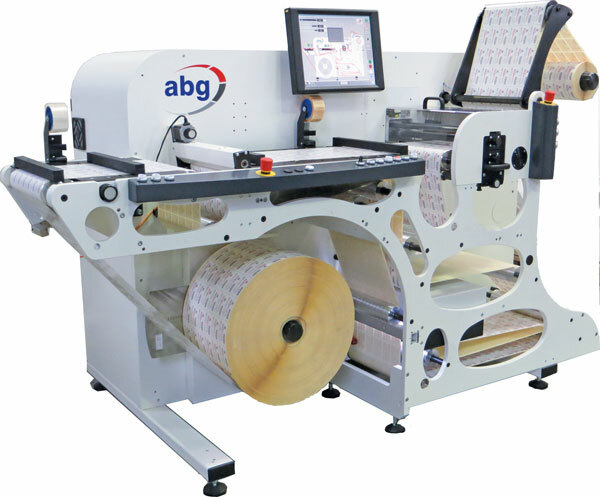 A B Graphic International's slitter rewinders come with a wide range of options including die cutting stations. With the possibility of running up to 220 metres a minute and 110 metres a minute with re register, the die cutting station is a great option for finishing blank or printed web. The all new HSR twin from A B Graphic International is the multipurpose high speed rewinder for all your finishing needs. With the ability to handle both unsupported film and label stock the HSR twin can run at speeds of up to 300 metres a minute and with its closed loop servo technology ensures the best tension control in the market. 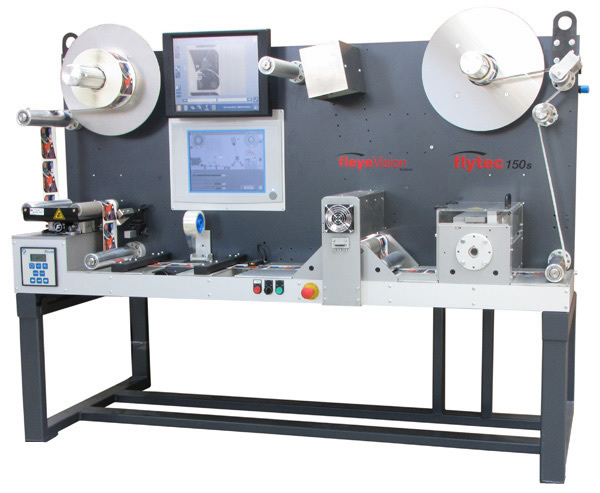 The machine has been specifically designed to handle filmic products with twin rewind, servo motors, scrolled rollers, lay on rollers and the option of razor blade slitting. 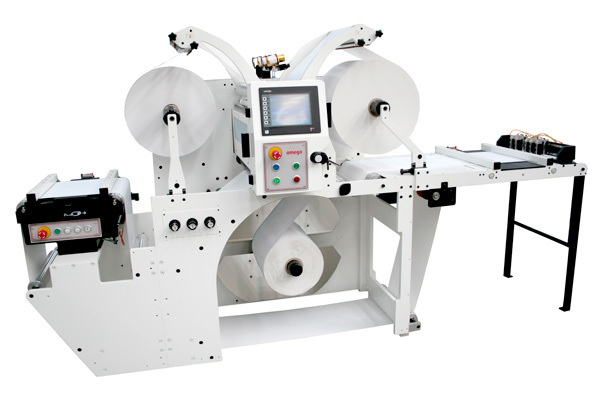 The HSR twin is the finishing solution for both labels and film. sophistication to meet today’s ever increasing demands and keep you ahead of the competition. We guarantee highest productivity with rewinding speed up to 350 m / min. The ergonomic design of the SRI allows you to select your choice of operating position standing or sitting. The operator can choose if he wants finishing as a horizontal or vertical production solution - all in one - his choice! for waste processing complete the picture. Adjustable web clamps allow a variable splicing area to glue in even large labels without a problem. An arrangeable splicing table after the rewind with an operating stroboscope simplifies the visual control. The Compact, economic, one stop solution for the pharmaceutical industry and security markets. The Flytech 150 allows 100% inspection of the web while maintaining a very small footprint. The machine consists of a 100% printface control system and allows each defect to be inspected and then re inspected, meeting the demands of the pharmaceutical industry and other high security markets. The Flytech 150 can inspect single lane web widths of up to 250mm and has the option to be fitted with inkjet technology, allowing sequential numbering, barcodes and sell by dates to be applied in one pass. A B Graphic International Ltd are proud to release their new Omega 2010 Rewinder. Based on their vast experience in pharmaceutical inspection and special security applications that require 100% inspection the Omega 2010 can inspect slit and rewind web widths of 330 and 410 with 100% accuracy. Driven by a new intelligent menu system and a new accumulator, the Omega 2010 can inspect printface control as standard while offering a wide range of inspection options including, Barcode inspection, OCR and Braille inspection. With the Omega 2010 from A B Graphic International Ltd each defect is inspected and then re-inspected to ensure a 100% error free web, suitable for the pharmaceutical industry or other high security applications. The Omega 2010 from A B Graphic International Ltd also applies inkjet barcodes, sell by dates and sequential numbering to the print face or backside of the web. A B Graphic International Ltd are proud to release their new Omega 3010 which has been specially designed to handle booklet labels. Based on their vast experience in Booklet inspection and the inspection of high security products the Omega 3010 can rewind Booklet labels in 330 and 410 web widths. Driven by a new intelligent menu system and a new accumulator the Omega 3010 can inspect printface control as standard while offering a wide range of inspection options including, Barcode inspection, OCR and Braille inspection. With the Omega 3010 from A B Graphic International Ltd each defect is inspected and then re-inspected to ensure a 100% error free web suitable for the pharmaceutical industry or other high security applications. The Omega 3010 from A B Graphic International Ltd also applies inkjet barcodes, sell by dates and sequential numbering to the print face or backside of the web. The fleyeVision 100% camera system from A B Graphic International Ltd is the fully modular solution for all your inspection needs. Add value to your business while being confident that each label you send out is verified buy the 100% camera inspection system. The system uses line scan technology, going from 1k to 8k resolution cameras to detect print errors such as scratches, text irregularities ink blobs, registration shifts as well as colour variations. The fleyeVision system is also capable of inspecting reflective foils and holograms. The system is capable of being mounted on press, or on finishing equipment, and works by identifying an error and then presenting the error to the operator depending on the application. The fleyeVision system from A B Graphic International Ltd is the fully modular solution ensuring that the customers exact requirements are met. Available options include full colour inspection, Barcode Inspection, OCR inspection, PDF comparison modules, Pharmaceutical inspection modules and even Braille inspection. Down load the brochure below to learn more about the available options and workflows for the fleyeVision system. Press to Rewinder Automated Workflow – inspect on press and automatically remove waste in the rewind department.